You will earn 9,633 Reward Points. Earn 1 reward point for every 1 dollar spent. 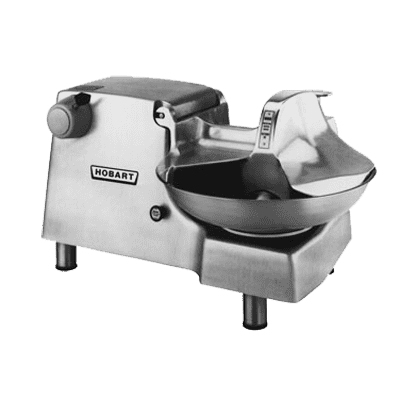 The Hobart 84186-4 Food Cutter with #12 attachment hub is perfect for processing a wide variety of meats, vegetables, fruits, and more for your meals. It has a 1 hp motor and cutlery-grade, stainless steel blades that rotate at an impressive 1725 RPM, while the 18"-diameter, stainless steel bowl rotates at 20 RPM. This unit features a bowl cover with safety interlock, an on/off power switch that works only when the bowl cover is locked, and an opening in the bowl cover to easily add ingredients as it turns. 3" stainless steel legs with rubber feet are also provided to ensure stability while in use. It uses a voltage of 230/60/1. When it's time for food prep, you can never have enough of the Hobart 84186-4 Food Cutter. It uses a voltage of 230/60/1. The legs on this item are 3" legs. This item was made in the USA.